I've been trying to get a picture of this guy for weeks. I see him swooping around every once in a while but I can never see where he lands. A few weeks ago, my mother and I were sitting in my living room talking and watching the birds do their thing outside when he swooped down and picked up a dove right in front of us, and took off with him clutched in his claws! I know when he's lurking because all the other birds and rodents scatter. I just now watched him fly by the window - I saw his giant shadow just as all the other birds took off. Then he came back and landed on the edge of the birdbath. He's a red-tailed hawk and he's huge! 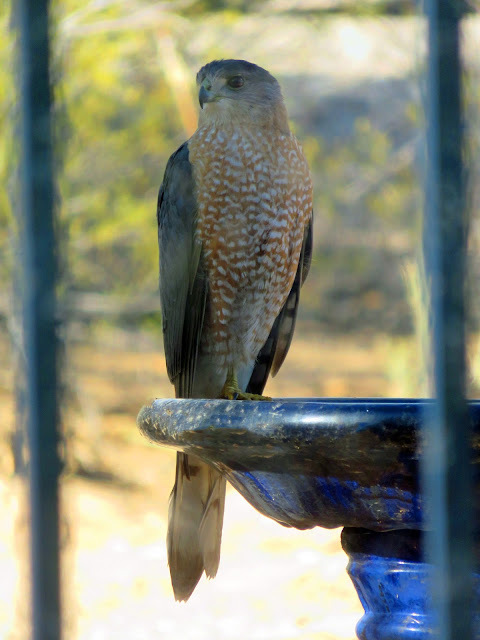 I was able to get this picture because he spent a lot of time on the birdbath. He was sipping, dipping, preening. Ed just filled it, so the water was fresh. He had the place to himself since he scared everything else away. I took the picture through the window - because I don't go outside when the temperature breaks the 70-degree mark - and I love that I can see his speckled breast. When he flies, his red tail is visible. He's kinda beautiful when he soars through the air. I just hope he doesn't nail me in the back of the head and knock me over like one of these hawks did to my mother last year. At least I don't have to worry about him flying off with me. That hawk is very regal looking!